Tropical Storm Irene in 2011 devastated many towns in rural Vermont. The town of Londonderry, Vermont was inundated, severely damaging properties in the heart of the town center. In August 2013 in partnership with Windham Regional Commission, the Center for Creative Solutions led a six-day workshop focused on the uses for several properties participating in a Federal buyout program. CCS Core Fellows, Jonathan Fogelson and Jason Bregman, from Michael Singer Studio guided the inquiry and investigation. CCS Visiting Fellows, Liz Lerman –choreographer and educator, Richard Rabinowitz – public historian, Calen Colby – structural engineer and Jono Neiger – biologist and sustainable landscape designer spent one or two days with the project team, engaging in the inquiry and offering different ways of seeing the sites and understanding the community context. Through the collaborative and creative process, the workshop team framed and reframed the critical issues so that the buyout properties came to be seen as an opportunity for flood control and, at the same time, a multipurpose commons with social and economic benefits for residents and visitors. The team explored and presented to the Town three approaches for addressing flood control as well as ways for the site to be a public commons. 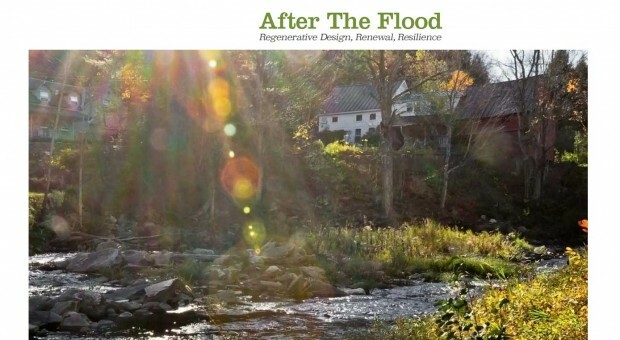 Following the workshop, residents formed a task force to continue and broaden the conversation about flood resilience and the uses for the buyout properties in this context. They created a web site, developed public information and held a community forum at which the discussion centered on flood control and the merits of different approaches in the best interest of the community. At the March 2014 Town Meeting, Londonderry residents unanimously approved an article to continue planning for the reuse and redesign of the buyout properties and to seek financial support for implementation.